A few weeks ago we published The Best Places to Find UX/UI Inspiration Online, the first post in a series where we’re diving into the best places to find creative inspiration across the web. Like we said then, there are a lot of ways to find inspiration online. A. Lot. If you’re just getting started as a designer, it can be downright overwhelming and nearly impossible to focus when there are so many amazing sites showcasing incredible design work just a few clicks away. This week we’re moving on to Visual Design, another highly in-demand creative skill (if you’re curious about the difference between UX and Visual Design, check out this article). From Branding and Identity to Typography and Color Theory, we’re aggregating the best sources from across the web. Get ready to bookmark! If you’re just starting to build up your Visual Design skills, here are a few of our favorite platforms for learning the basics of Visual Design. Remember to learn the fundamental concepts that inform the decisions designers make before you try to perfect your technical skills. By focusing on fundamentals first, you’ll progress much more quickly than if you dive headfirst into Photoshop before understanding the basics. Skillshare Design Courses – probably the best known creative education site out there today, Skillshare paved the way for incredibly high quality creative classes from well-known and accomplished professionals. Learn Design the Hard Way – an awesome (and free) design course intended to teach the basics of Visual Design to aspiring creatives. Taught in Sketch, this is an awesome primer for anyone just getting started. Treehouse Design Courses – Most people know Treehouse for their amazing coding classes, but they also have a quickly growing repository of Design classes designed for beginners and intermediate designers. Udemy Design Courses – Similar to Skillshare, Udemy has a huge repository of awesome design courses from big name and independent designers around the world. Brit + Co – Brit + Co is a platform that operates in a similar space to Skillshare, with a strong focus on creative courses for all levels of designers. They have a ton of classes on DIY creative skills, in addition to Visual Design, Lettering, and Illustration. Skillcrush – Skillcrush was started by a few amazing self-taught female developers and designers who wanted to create a platform that provided aspiring creatives with the tools and knowledge they need to build their dream careers. Coursera Design Fundamentals – One of the original online learning platforms, Coursera teaches courses from acclaimed universities around the world. Tuts+ – One of the largest repositories of educational resources and tutorials on the web, they’re especially well known for their coding tutorials, but like Treehouse, also have an excellent collection of Design courses! Next up are some of our favorite Visual Design-focused blogs and sites on the web. Find a few you like and add them to your morning routine. Not only do they feature awesome visual inspiration, but they’re also a great place to find interviews, videos, and more from some of the best known Visual Designers in the world. Smashing Magazine – One of the largest design blogs on the internet, Smashing publishes dozens of articles every week on topics ranging from design trends to interviews with famous designer founders. 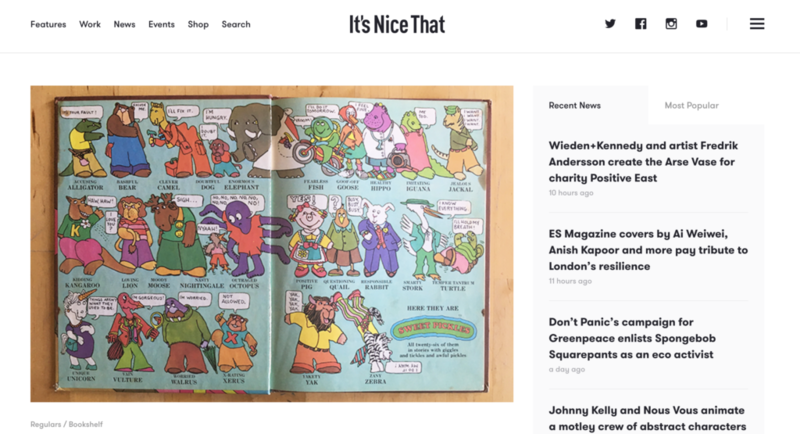 It’s Nice That – We love It’s Nice That! Always quirky and constantly surprising, the UK-based site publishes all that is unique in the design world, from amazing branding deep dives to profiles of up-and-coming design talent around the world. They also have a new site called Lecture in Progress whose mission is to provide graduating design students with the tools they need to launch their creative careers. Creative Boom – Creative Boom is another UK-based design inspiration site whose mission is to provide inspiration and useful tips and resources for people trying to build creative careers. Onextrapixel – Onextrapixel focuses on providing resources to make the jobs of designers and web developers just a bit simpler. Speckyboy – Another amazing resources full of interviews, tips, collections, and tutorials for designers at every level of their career. Beautiful Pixels – A site focused on showcasing the best User Interface work being created around the world. 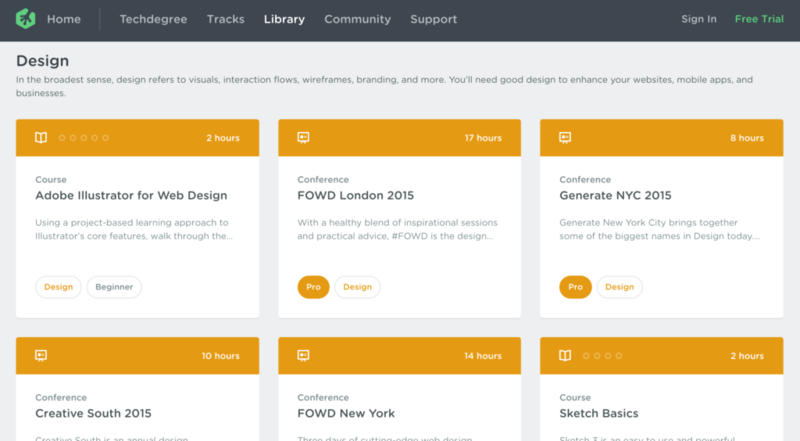 A must visit for any visual designer trying to expand their expertise! Creative Bloq – An incredibly active design site that publishes dozens of articles every week about Graphic Design, Web Design, Typography, and everything else design-related! Booooooom – Focused on showcasing truly unique and downright wild design work, Booooooom is a great place to go to be reminded of just how diverse the creative world is. Abduzeedo – What list is complete without the versatile Abduzeedo, an amazing collection of inspirational work from designers, illustrators, and artists in every facet of the creative world. If you want to be a well-rounded Visual Designer, you’ll need a strong understanding of branding and identity design. Understanding what makes a strong visual brand is crucial to excelling in Visual Design, so we’ve pulled together a few of our favorite sites that showcase the most exciting branding and identity design from companies in every industry imaginable. Brand New – If you’re looking for inspiration for your newest logo or branding project, look no further than Brand New. An incredible showcase site featuring examples of some of the coolest and most unique branding work being done today. For Print Only – Similarly, if you’re working on a print design project, this site will be your new best friend. Showcasing amazing posters, business cards, and more, For Print Only features only the best of the print design world. Ad Collector – Take one quick look at this site featuring the most original work being done in advertising and you’ll be left wondering why most of the ads you see online and on TV are so mediocre. Rest assured – there is a ton of inspiring work being done in advertising, and this site is your best bet to stay on top of it. Identity Designed – Rather than just showcasing tons of great branding design, Identity Designed does deep dives into some of the most interesting branding being done around the world. Logo Design Love – another great aggregator of beautiful logo work on the web and in print. It might seem obvious, but understanding the value of lettering and typography in Visual Design is a crucial skill for any Visual Designer. Here are a few of the best sources of Lettering and Typography inspiration on the web. Typographic Posters – You might not be familiar with the concept of typographic posters, but take a quick look at this site and you’ll never be the same. Typographic Posters keeps its focus very specific, showcasing the most interesting typography-based poster design submitted by members worldwide. Typewolf – If you’re interested in deepening your knowledge of the vast variety of typefaces that have been created, look no further than Typewolf. They curate resources on typography and mix them with recommendations and lists of the best fonts for any situation. Typeverything – Anything and everything related to typography and fonts. From tutorials to interviews to lists, they’ve got it all! Paletton – A bit unlike the rest of the sites on this list, Paletton is an incredibly versatile tool that lets you create amazing color palettes for any project. 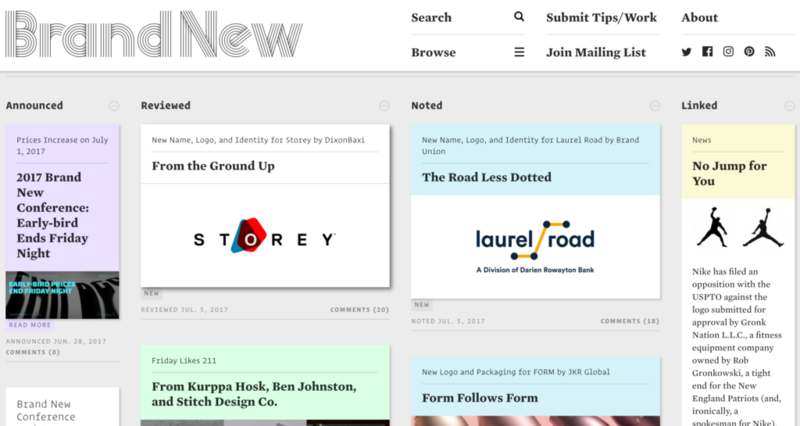 One of the easiest ways to get inspired is by checking out some amazing design aggregation tools. These sites pull in work from designers around the world and ensure that you’ll never have a lack of visual inspiration when working on a new project. 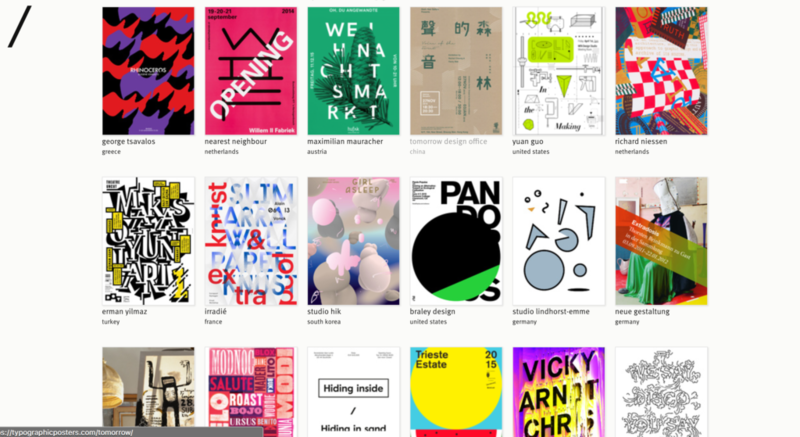 Designspiration – A simple and beautiful stream of design work from artists around the world. With amazing work ranging from typography to logo design to illustration, Designspiration is a must visit when seeking inspiration. The Design Blog – a site that showcases a curated selection of the best design and branding work from individuals and studios around the world. They also love featuring young designers so keep them in mind if you’re hoping to have your work showcased! The Best Designs – This site curates a daily list of unique websites from all corners of the internet. They also showcase not just designs, but designer and workspaces as well. 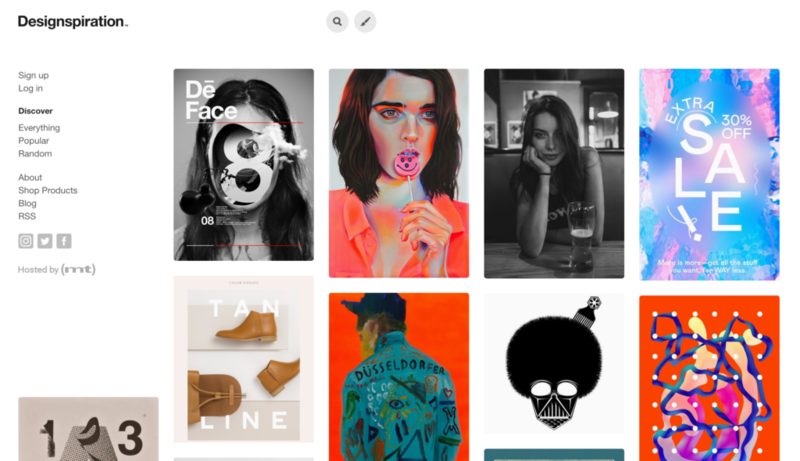 Niice – Ever wanted a tool to easily create a moodboard for a client or project? Well, Niice is the solution! Generate moodboards based on keywords, colors, or vibes. Behance – Not much to say about Behance – if you’re a designer, you’ve definitely heard of them. Dribbble – Same thing with Dribbble. Find jobs, post your work, engage with others, and more. Template.net – Never run out of templates for your SME business enterprises! When you have limited time and money to run a successful work, creating templates on your own may cost you a lot. At Template.net you don’t have to worry about your work requirement because it provides you free ready-made templates for the successful running of your work. Finally, here are a few lists of some of the most exciting designers to follow on social media. If you’re just getting started in design, it’s important to start engaging with designers you like and trying to understand what motivates and influences them. Following some of your favorite designers on social media is a great way to become a part of an active community of creatives online! So there you go – dozens of amazing sources of creative inspiration to get you through any creative challenge that’s thrown at you! Our goal at RookieUp is to help designers find inspiration, build their portfolios, and land their dream jobs. If you ever need a bit of personalized feedback, you can chat with any of the Visual Design mentors at RookieUp! And if you want some additional help as you get started, answer two questions here and we’ll send you a personalized action plan and mentor recommendations tailored to your goals! Until next time, when we’ll dive into Web Development inspiration! Answer two questions and we’ll send you an action plan and mentor picks to help you jumpstart your design career!